If you’ve ever compared regular TV to High Definition (HD) TV you’ll know what we mean when we say “Oh Wow! That is an incredible picture.” In this case, we are referring to the video coming from our newest nature cam. Believe us, if birds had eye lashes, you’d be able to see each and every one with this amazing camera. 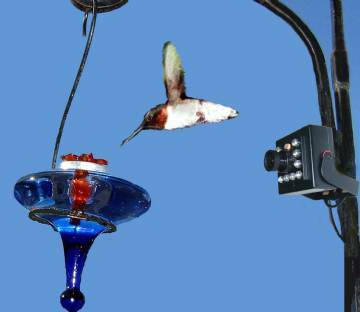 The Hawk Eye HD has 700 tvl (television lines), 10 infrared diodes for unsurpassed night vision, variable focus, wide angle lens, and a crystal clear microphone. Connect to any TV or video compatible computer through a 100’ detachable AV/power cable . . . the same we use on all our cameras, and so can connect to existing Hawk Eye extension cables. Note: This listing is for the HD Camera with cable only. Nestbox not included. 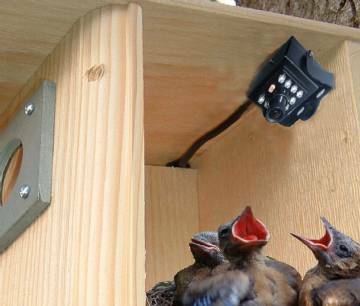 For nestboxes with built-in Hawk Eye HD Cams check our entire line of Birdhouse Spy Cam products.